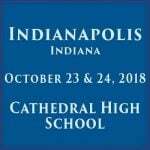 MOMM is coming to Indianapolis! Take a leap into the mystical life of the young Polish St. Faustina and her encounters with Jesus, the Divine Mercy in this nationally acclaimed multimedia presentation. Holy Spirit is excited to welcome Dave & Joan Maroney of Mother of Mercy Messengers (MOMM) for an evening of inspiration and grace. Come and draw closer to the tender Heart of Jesus and learn why this is an important message for the world today. A Holy Hour with songs, prayers from the [i]Diary of Saint Maria Faustina Kowalska[/i], and opportunity for confession will follow the presentation. Holy Hour — always beautiful and the best way to make the most of the gathering. The Holy Hour will include songs, prayers, and passages from the [i]Diary of Saint Maria Faustina Kowalska[/i] and will conclude with the recitation of the Chaplet of Divine Mercy. 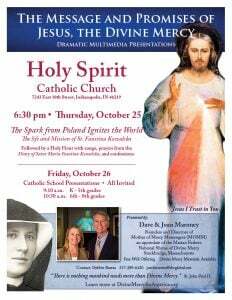 All are welcome to these presentations, which are similar to The Spark from Poland Ignites the World – The Life and Mission of Saint Faustina Kowalska given on Thursday evening but geared toward the age group present. The Presentations conclude with the recitation of the Chaplet of Divine Mercy. Each classroom will be given a free 11 x 14 Divine Mercy Image. Each student will receive a blessed 5 x 7 Divine Mercy Image to take home. Accented with a blank ribbon, this image is designed for the student to fill in “Jesus, I Trust in You” on the bottom of the card, allowing them to make a personal commitment to trust in the Lord.